Lindsay grew up in the Bellevue/Issaquah area and went to Sammamish high school, where she graduated in 2002. An athlete all of her life, Lindsay’s 12+ years background in competitive swimming, ultimately lead to her career in teaching. She began teaching aquatic based classes and became a ARC Lifeguarding 18 years ago. Then 7 years ago moved out of the pool to focus on land-based fitness. Lindsay practiced Vinyasa, power Flow, mat Pilates, PiYo®, and TRX® (Suspension Training) for years before pursuing her certifications. Lindsay fell in love with Vinyasa yoga and mat Pilates for the benefits of balance, flexibility, and breath awareness. Specializing in Ashtanga yoga with a Vinyasa flow, she has a passion for challenging her students and helping them to take their practice to the next level. Inversions, arm balancing, deep bends, and twist are just some of her favorite explorations in practice. 3 years ago, Lindsay decided to put her knowledge of water and land based exercise together. Through Bliss Paddle Yoga she certified as a Stand Up Paddleboard Yoga instructor and then certified twice as a PaddleFit® Core coach. She now teaches and races paddleboards on bodies of water all over the PNW. As a teacher, Lindsay’s passion is to make a positive impact on students’ lives. She believes through a healthy mind, body, and spirit you can achieve anything. She enjoys teaching all ability levels, beginners to advanced students. As a mother, Lindsay feels a healthy lifestyle should be introduced to children at a young age and encouraged through their lives. She is very passionate about raising her two children and helping them learn to lead healthy lives of their own one day. Lindsay began teaching Big Kids and Tween Yoga classes in Issaquah, WA over 3 years ago for her children to be able to grow their practice. In 2015, Carley earned her 200 hour teaching certificate through 8 Limbs Yoga Centers and became a certified SUP Yoga instructor through Paddle Bliss. She has also taken workshops with Annie Carpenter, Carmen Aguilar, and Kino MacGregor. Amy, raised in New Orleans, LA began her yoga journey in 1995 and continues to develop through practice & humility. Once a National ranking Competitive Figure Skater, Marathon Runner and now recreational cyclist & skier Amy has experienced the physical, emotional, & mental challenges to win, to greatly fail, and learning to to get back up. After graduating from Louisiana State University with her Bachelor Degree in Construction Management Amy created a very success 20+ year career being part of multi-million dollar projects. Amy’s days were full and long as construction never sleeps so her yoga practice became her place to heal and counter pose the stress hidden deep within her whole body & mind. Loving her own practice and having the time to dedicate (no kids) Amy received her 500 hour Viniyoga Certification in 2007 and completed her Yoga Therapist Certification in May 2013 accredited by the International Association of Yoga Therapist. After having her son in 2009, Amy decided to quit her career in Construction and focus on her new path as Mama and teach Yoga & Meditation. Melissa’s yoga journey began in 2013 shortly after having her first child. She was tired all the time, stressed from the pressures that came with being a new mom with a high pressure job, and was left constantly putting her personal health at the bottom of the priority list. After hearing a lot of positive experiences from friends about yoga, she decided to give it a shot. After her first class she was hooked! Within a few months of regular practice, she felt healthier and stronger than ever, both mentally and physically. Yoga taught her about the importance of self care, being present, living with an attitude of gratitude, letting go of expectations and resentments; and through all of that it truly changed her life for the better. She wanted to share those revelations with the world. She completed her 200hr RYT training at Get Zen Hot Yoga in 2016 after having her second baby. In 2018 she became a certified Kidding Around Yoga teacher to further her practice with her own children, she loved the KAY practice so much that she decided she wanted to share it with as many families as she could! Shortly after completing her second training course she started her business, Family Yoga with Melissa. She is a firm believer that yoga can change the world, one peaceful child/person at a time. As a yoga student for twenty years, Sarah has long recognized the powerful healing accessible through yoga. In her own journey through addiction recovery, motherhood, and divorce, yoga was an indispensable tool in healing, self-care, and growth. After personally experiencing the benefits that yoga provides through mindfulness, physical wellness, and self-awareness, she felt called to become a teacher in order to bring the goodness to others. Sarah’s 200hr RYT training was completed at the Viveka Yoga School of Mercer Island, which included diverse modalities and a focus on mindful class sequencing with emphasis on anatomy and functional movement. Her ongoing training includes addiction recovery yoga theory, the study of yoga nidra and restorative/yin style asana, and assorted specialized workshops on everything from chakras to alignment. Sarah is excited to join the One Mind Yoga family and can’t wait to meet you on the mat some day soon. Sarah grew up with her mother practicing yoga at home, and began her own yoga practice in her teens to balance the effects of weightlifting. She’s dropped the weightlifting, but has continued to explore yoga, which has supported her in many ways in the years since. At present, she’s cultivating a practice for long term physical health, and beginning to explore how increase her social justice work informed by study in the yamas and niyamas. She teaches asana as practices for lifelong physical and mental health. Her intention is to help students create and cultivate their own practice in calm and nurturing space. Her asana classes integrate strength, flow, and mindfulness to promote self-awareness in mind and body. She is especially passionate about working with expectant and new mothers to cultivate practices that nurture and support them through the transformations of pregnancy and early parenthood. In addition to teaching yoga, Sarah is a birth doula and childbirth educator serving the Eastside (www.happybabyseattle.com). Sarah combines an academic background in human anatomy and public health with training in Eastern and Western philosophy. After 15 years of personal practice, Sarah completed 200 hour and Prenatal Yoga teacher training at 8 Limbs Yoga Center, and is currently pursuing a 500 hour certification. In her free time, she loves to hike, camp, and travel with her family and spend time with her two boys. Lori grew up in New Jersey and spent most of her adult life in Indianapolis. She moved to Issaquah in 2015 and absolutely loves life in the Pacific Northwest. Lori has been practicing yoga since 1999. Although she was initially attracted to yoga for the physical challenge, she soon came to appreciate the more mindful benefits of her yoga practice. Making a positive difference in people’s lives is important to Lori, so as her personal practice grew she wanted to bring yoga to other people. Lori earned her 200-hour Hatha Yoga Teacher Training Certificate at All People Yoga Center in Indianapolis in 2002 and studied Iyengar Yoga for several years with Jyoti Hansa. She began teaching vinyasa yoga at various yoga studios in Indianapolis in 2002 and appreciates any opportunity to share the joy of yoga with others. Lori aspires to integrate the physical, mental, and spiritual aspects of yoga in her classes through alignment, conscious breathing, and mindfulness. She begins each class with few moments of centering and focused breathing and ends each class with 5-10 minutes of deep relaxation. Throughout her classes, Lori links movement with breath and provides verbal cues to help students maintain some mindfulness of their body. She hopes you will come to her classes ready to learn and laugh and leave feeling more peaceful, joyful, and contented. Brigitte grew up in Bellevue, Washington and went to college at Florida Institute of Technology where she studied Psychology and Communications. Brigitte recently obtained her yoga teaching certificate in Kathmandu, Nepal at the Mandala Yoga Studio. A truly amazing experience in which she was completely immersed in yoga. Not only did she learn about asanas (poses), modifications, and adjustments, but also about aspects beyond the physical exercise related to the practice, such as history, philosophy, and meditation. In 2008, Brigitte had a major spinal fusion surgery where most of her spine was fused. Tightness overcome her entire body and it took a very long time to realize that she needed to be stretching in her life, because as she got older the tightness developed into pain and it was holding her back from things she wanted to do. 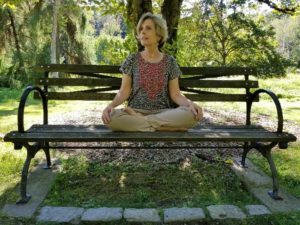 Brigitte began practicing yoga in 2015 and soon found that yoga was the way to healing her body and mind. Through teaching yoga, Brigitte hopes to show people that anyone can do yoga. Her desire is to help people incorporate yoga into their lives so they may find happiness and health. 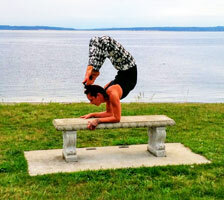 Hana Medina first came to yoga in 2012 for an alternative activity to long-distance running. After having hip surgery at age 27, she needed a lower-impact, joint-friendly excercise. At the time she started practicing, she was also planning her wedding, and quickly found the calming and stress-reducing benefits of yoga to be beneficial on and off the mat. Hana has found yoga to be a deeply healing practice not only for all of life’s major transitions, but also for staying balanced for daily living. She wanted to share that joy and healing with others, and completed her 200-hr teacher training at Get Hot Yoga in October 2018. She enjoys practicing and teaching vinyasa, slow flow, yin and restorative classes. Yoga has been especially beneficial to her journey into motherhood and loves finding silly ways to introduce her toddler (and your littles!) to the practice. She is currently getting her kids yoga certification with Kidding Around Yoga.